Big the Musical is to transfer to the Dominion Theatre in the West End for a limited 9 week period from 6th September to 2nd November prior to White Christmas opening there on 16th November. There will be gala night to support Make-A-Wish on 17 September. 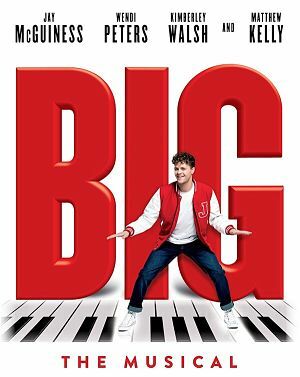 Based on the hit 1988 Broadway film of the same name starring Tom Hanks, the musical has songs by David Shire and Richard Maltby and book by John Wiedman. It follows Josh Baskin who is twelve-years-old and hates being little, until one night at the carnival the mysterious Zoltar machine grants his wish to be big. Now trapped in an adult’s body and alone in New York, he innocently tries to find his way around a grown-up world where it’s all work and no play. But whilst everyone around him tries to act their age, Josh just can’t help being himself. Maybe he’s going to end up teaching the real adults a thing or two…. Infra-red system 10 headsets and 10 neck loops available. Ask the duty manager upon arrival at the theatre. Platform lift down 10 steps. 3 spaces for wheelchair users at XX50, YY50, ZZ50 (the last 2 on a slight slope). Transfer seating to any aisle seat. People with motorised wheelchairs or wheelchairs (maximum of 3) can go in Box B the entrance is to the side of the theatre on Bainbridge Street. Adapted toilet towards front left of Stalls.